Bearing the brunt of someone's anger can focus the mind wonderfully. This can help us to knuckle down on well-defined tasks, but can hinder activities that depend on open, lateral thinking. 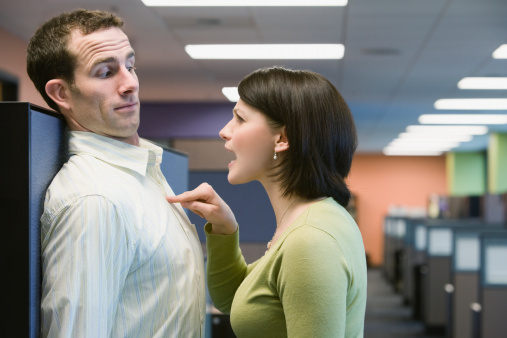 In the Journal of Applied Psychology, Ella Miron-Spektor and colleagues demonstrate how simply observing an angry outburst in a work context can reproduce these effects. They also explore what happens when angry messages are delivered with a twist of sarcasm. The researchers ran three studies asking 375 engineering students to imagine being a customer service agent. The primary task, a written problem, was preceded by an observation stage where they listened to a recorded conversation between another service agent and a customer who was either neutral or overtly hostile. Participants in the angry condition performed better at the assessed problem when it was analytic and closed in scope but worse at insight problems requiring lateral thinking and discovery, akin to the classic 'make a functioning wall-mounted light from only a candle, tin tack and box of matches'*. One of the studies collected ratings of the emotional sense of threat that participants felt, which partly mediated the influence of anger on the two different types of tasks. This suggests that observed anger causes participants to adopt more of a prevention orientation, a state in which you adopt a narrow focus on immediate concerns in the hope of avoiding suffering and gaining security. Another study added a further condition that presented a recorded exchange that was sarcastic rather than overtly hostile, using withering phrases like “Your service is 'fast as a turtle'”. Participants in this condition actually performed the best on the creative problem. The researchers suspected that the humour of sarcasm makes it less overtly threatening, hence less likely to trigger prevention orientation. This was borne out by the more moderate anger ratings given by participants in the condition. Additionally, sarcastic comments need to be actively made sense of, as they stand at odds with the true situation, such as giving high praise to mediocrity. Parsing such paradoxes by looking at them in different ways might kick us into a mental gear ready for complex thinking. To examine this, participants worked through the classic Kelly repertory grid technique, in which you repeatedly select trios of people from a list and articulate how one is different from the other two, revealing the range of different dimensions you are able to apply to multifaceted reality. Those exposed to sarcasm generated more dimensions, suggesting they could deal with more cognitive complexity, looking at issues from more than one angle. In the workplace, measured, appropriate anger may remind people of priorities and provide needed focus. But by sending individuals into fire-fighting mode it's also likely to hamper insight and the chances of recognising deeper issues. Miron-Spektor's team demonstrate that merely observing anger directed at another in a work-relevant exchange can deliver these effects. This means that enforcing demands and directives through anger may generate risk-averse work climates. Yet there is a possible solution: to leaven harder messages with humour. And if you think I'm talking about sarcasm... way to go, reader! *The trick is to recognise the match box itself, rather than just its contents, can be part of the solution. Pin the match tray to the wall, melt wax off the candle into the tray and use this to firmly affix the candle. Once lit, the stable candle will produce light without creating any dripping mess on the floor. Good post - I have long known as a scientist and musician that 'happy shiny people' are not the only way to extract creativity from yourself and others.